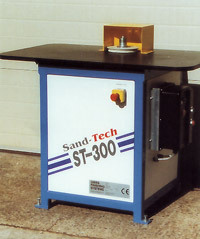 The ST 300 is designed for the edge sanding of small and odd shaped components. 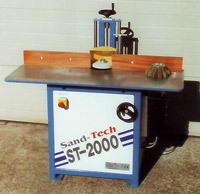 The ST 2000 can be fitted with a 6, 8, or 10 block sanding head or the ST Wheel for MDF. Both are ideal for profile sanding as they retain the detail of the profile. 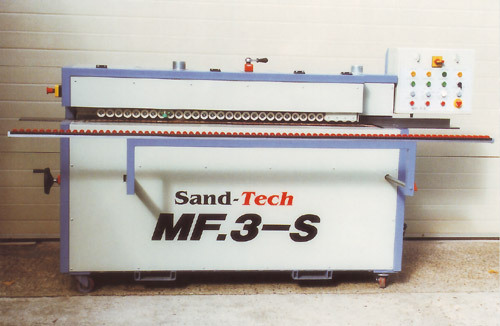 The SandTech MF.3 is a unique Profile Edge sander, which sands and seals MDF edges in one pass. Sanding is achieved using our special ST Wheels. When run at the correct speed, these sand and seal the MDF edges. This usually saves one coat of lacquer and virtually eliminates denibbing. As the wheel wears, and the diameter is reduced, the MF.3 automatically increases the spindle rpm to keep the surface speed constant. Feed speed is also infinately variable, to allow maximum output speed to be set for varying types of MDF and of profile shapes. Wheels are easily shaped to your profile. 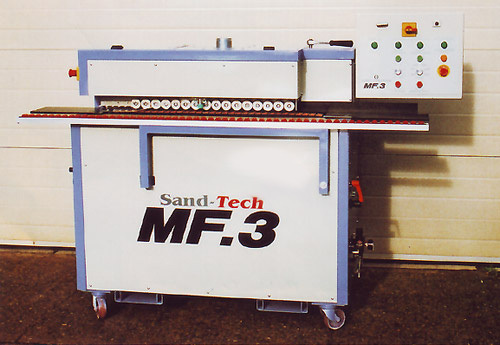 The MF.3-S has been developed from the successful MF.3, to provide a machine to sand and seal sawn edges as well as profiled edges, which the MF.3 can process. This requirement is especially prevalent in the shopfitting industry, where the MDF panels are sawn to size and then painted or lacquered without further edge machining. To achieve the required smooth finish, the MF.3-S is fitted with a belt sanding head prior to the MF.3 style ST Wheel sanding and setting head. The belt sanding head removes the saw marks from the edge of the panel (up to 1mm removed) prior to the edge being sanded and sealed by the ST Wheel head. The RS 1 is designed for sanding small round and oval items, such as lampshade bases, plaques and clock faces. 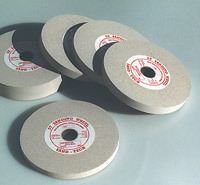 Various alternative sanding heads can be used to suit different materials. For MDF, the use of our special ST Wheels gives simultanious sanding and sealing, so that when sprayed, virtually no denibbing is required. For solid wood our San-Dit heads provide accurate profile sanding. Main motor 1hp fitted with a 32mm dia spindle, variable speed, 400 - 2000rpm. Table rotation by 0.25hp motor gearbox, with variable speed drive. Control conole mounted above machine deck, with controls and speed controls atc. Just plud into 13 amp socket. Adjustable positioning stops to locate workpiece on turntable. Manual operation of swing arm to take workpiece to sanding head, with adjustable constant pressure system to hold workpiece against sanding head. Automatic sequence of operation after clamping, i.e. as the swing arm is moved, rotation starts. After sanding, as arm is retracted, rotation stops and clamp opens. Interchangeable turntables to suit different size jobs. 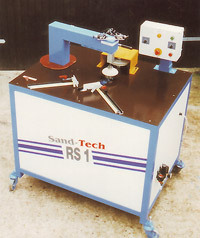 Machine supplied with 4 turntables as standard. The S.T. 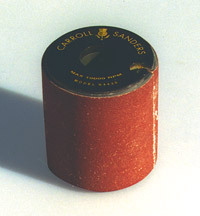 Wheels sand and seal MDF edges and are comprised of a combination of resins impregnated with abrasive of various grits. A firm sanding head suitable for general sanding. Replacement abrasives can be simply clipped in place making it economical to use. 6 - 8 and 10 - Block heads for profile edge sanding.